Need to control your pet? Well, grab his collar and leash and maybe he will let you. Made of only the finest leather available with finished edges and beautiful chrome hardware. Equipped with a durable adjustable buckle and O-ring in the front. 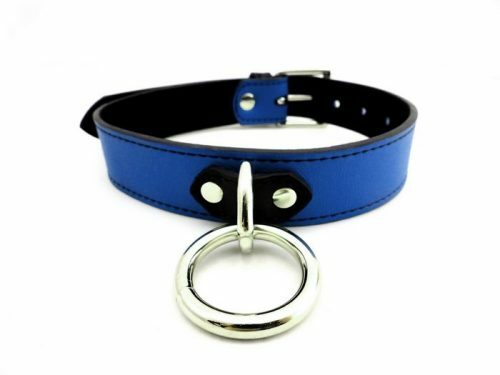 Your pet will look handsome in this genuine quality blue leather collar. About M2M – M2M your prime source for luxury leather gear and pleasure toys for ultimate man2man satisfaction: products designed for gay men by gay men since 2006. A simple plan to service the gay male market. M2M is still, after 12 years, the only brand with the courage to show two gay men on the front of the package. The brand connects proudly and quickly with the gay consumer. M2M Collar Leather D Ring Blue made using genuine leather and stainless steel. One size fits most.